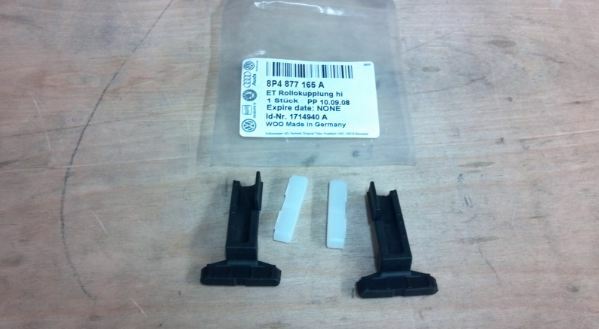 Need to know part numbers for the locking/release plastic "clips" of front & rear sunshades . The dealer is not helping much with this problem. If it's for the side windows there is a clip, or hook, towards the top to hold the shade up. Those are 8.62 each. For the shades on the roof, there are repair kits that have plastic T shaped parts that look like they go on the outer ends of the roller shades. If those break I'm sure it's going to cause a problem and we do sell a few of these kits. They are different from front to rear, they run 12.46 each and that has the 2 clips in it to repair just one sunshade. If in doubt I can send a picture to you of what is in this kit. Jeff. 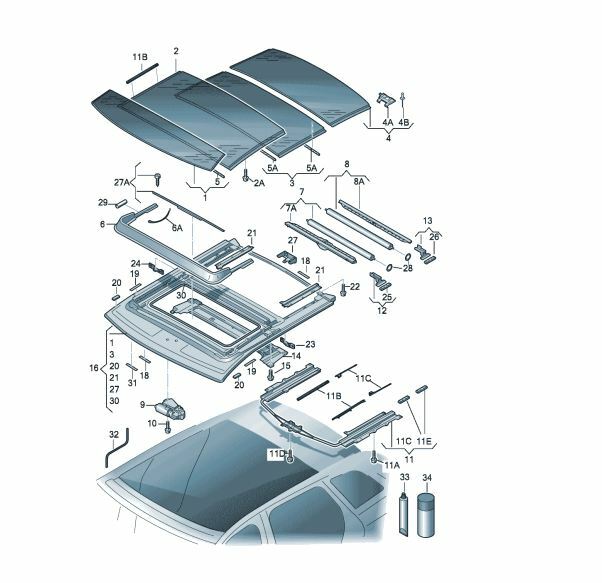 I would like the pics of both front & rear repair kits for the sunroof sunshades. I understand they will lock & unlock the sunshades. I might also order them, will see. 2006 Audi A 3 premium pkg. w. panoramic sunroof. Last edited by Lionel; 10-18-2012 at 02:23 PM. Below is #12, these look to be the guides on the ends of the previous picture, that support 7A. Last edited by Jeff-AudiUSAParts; 05-18-2013 at 01:56 PM. Last edited by Lionel; 10-17-2012 at 02:24 PM. On your order, the 7a and 8a ordered with Romney are a match to your vin number. Looks like he's got the right parts ordered for your car. Just installed the front roller blind bow to the shade/fabric. Took me 35 minutes ( first time ). Just finished installing the rear roller blind bow by attaching it to its shade/fabric. Aprox. 60 minutes = including uninstalling the broken one. Did not took off the head liner or the sky roof/glass. Piece of cake ! Saved $ 1.300 of labor & other parts the dealership wrote on the invoice plus five hours waiting. Thanks AudiUSAParts !